We've all seen it, and probably done it ourselves: Distracted driving. Each one of us has either seen or been the person eating a burger, reading a text message, typing in an address to the GPS system, putting on lip gloss, or just not paying attention to the road. Sometimes, we are fully aware that what we are doing is dangerous, but other times, do we realize just how distracted we are? I know that I am guilty of distracted driving. But I think my biggest issue is not realizing just how distracted I am. I've even been so caught up in my own thoughts that I space out while driving, even though I try to make it a point to pay attention to the road and nothing else. As far as I know, someone has yet to have invented a car that feeds you or does your makeup while you drive. But there are tools available to help drivers pay more attention to their driving and less to their devices. Accessory Genie has several different devices compatible with your favorite smartphone to keep you less distracted and more entertained on the road. Whether you are listening to music or talking on the phone, these FM transmitters are great for helping you stay focused when driving. The GOGroove FlexSMART-4i FM Transmitter is one of my favorites. Powered by a DC port, the FlexSMART-4i will securely hold and display your phone while you play audio through the 30-pin connector at the base of the unit. If you connect the phone to audio jack on the unit you can even route your calls through it and the music will fade out automatically. I especially love using the FlexSMART-4i when I'm using my GPS application on my iPhone because it'll play the step by step directions through my car speakers and display the map if I need a visual of where I am going. The GOGroove FlexSMART X2 is also another personal favorite because it connects to my phone through Bluetooth, taking away the necessity for me to rummage through my things and physically plug my phone into a transmitter. Another plus is that when my phone's battery is running low, I have the option of plugging in my charger to the USB port on the device and charging up my phone. The FlexSMART X2 is definitely a good option if you have multiple Bluetooth devices because you can easily sync all of them up to it. I also like to use my Auto Air Vent Mount in conjunction with the FlexSmart X2 when I'd like to see the display on my phone, like when I'm using a GPS system on my phone, which comfortably mounts my phone from an AC air vent in my car. 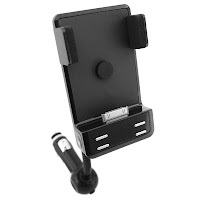 FM transmitters and device mounts like these and many others available at www.AccessoryGenie.com are compatible with many different smartphone brands and models, and work with MP3 players as well. If you're like me and use your phone in many different ways, like to listen to music or to navigate from location to location, you'll appreciate how much safer and simpler these devices will make your drive.